Media Magic is pleased to report that our ‘Manufacturing at Cristal’ recruiting video, produced last fall for Cristal Global / Millennium Inorganic of Ashtabula Township, Ohio, was recently featured at a local business event. Guest speakers at May’s ‘Profiles of Ashtabula County’ Breakfast Series, presented monthly by Growth Partnership for Ashtabula County, were Cristal’s Scott Strayer, Plants 1 and 2 Site Director and Misty Hejduk, Global Performance Manager . The ‘Manufacturing at Cristal’ video was scripted, edited and produced by Media Magic Creative Director, Cheryl Dickson-Walker. The film was shot on location, over several days, at Cristal’s Millennium Plants 1 and 2, and included interviews with about a dozen employees. Director of Photography was David Grant Walker, and Media Magicians Robert W. Kerr and Shannon Baker both worked on cameras and lighting. It was spearheaded internally by Cristal Human Resource and Community Relations person, Sherry Wilber. Like what you see? Contact Media Magic today about creating an affordable recruitment video for your business that gets results! Media Magic corporate video featured on LinkedIn! 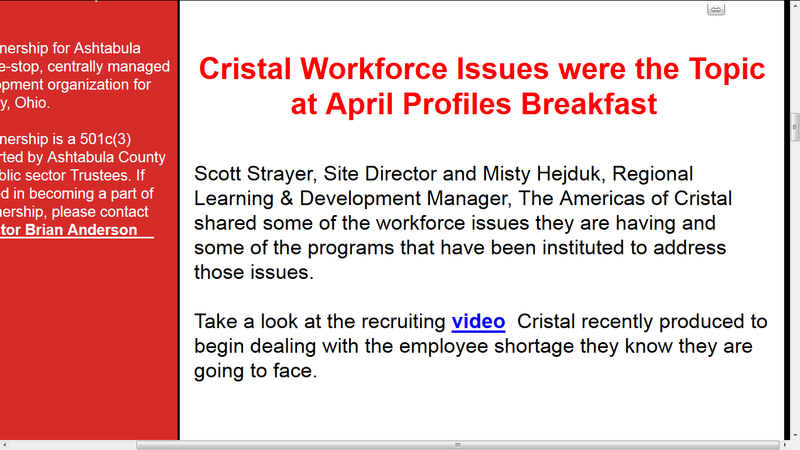 Media Magic’s Cristal Careers corporate video vignette is being featured on Cristal Career’s LinkedIn company page. this is one of five video vignettes that we shot and produced for their website – check it out!